Serenity Peak Chalet is a beautiful 2,912 square foot high-end, custom built home located within walking distance to the village. You do not need a vehicle to access the ski runs or the village. The Chalet is located on Sunburst Drive. It is just a short 3 minute walk to where you can ski in and out. The Chalet sleeps 8 very comfortably. The top floor boasts 4 good sized bedrooms, each with their own full en suite bathroom. All of the bathrooms have unique, top quality furniture and fixtures. The luxurious Master bathroom features double glass sinks and an extra large natural stone shower equipped with two shower heads, four body sprays and a hand shower. The living room features vaulted ceilings with floor to ceiling windows and a gorgeous natural stone propane fireplace, along with two full leather couches. A 55 inch flat screen LED television sits above the fireplace. There is a private deck off of the living room that has a propane BBQ and a luxurious seven-person private hot tub. The entertainment room features a 52 inch plasma television plus DVD player, equipped with digital cable. There is also a surround sound stereo system. The den has a pull out leather couch and free wireless internet access is provided. The kitchen boasts top of the line stainless steel appliances including a six-burner propane stove, a large Sub-Zero fridge and a built-in dishwasher, microwave, coffee maker, bar fridge and wine cooler. A beautiful, large marble countertop island separates the kitchen and living room. The dining area with bay windows and an oversized table completes the kitchen. The main level has hardwood floors throughout, with natural stone tile in the kitchen and entryway. It also includes a stunning, full bathroom and laundry facilities. The garage has a raised deck with benches for putting on and taking off ski equipment, and a large storage unit for all your outerwear. The garage is also equipped with radiant heat which warms the area up quite quickly. There are high quality mattresses and pillows in all four bedrooms. Luxurious linens and bedding are provided. Parking is available on the level driveway. We provide a cleaning service after your departure. Everything in the Chalet is top quality - including everything from the silverware all the way up to how it was built. We personally enjoy this Chalet during the year and take great pride in it. In order to keep the property much nicer than the typical rental, it is only rented to guests who will treat this Chalet as their own. We thoroughly enjoyed our stay at Serenity Peak Chalet. The property is conveniently located just off a main ski run and very close to the village, if you wish to walk down for supplies. All of the rooms were spacious, nicely appointed with high end finishes and comfortable furniture. It was an exceptional experience and we will definitely be back. Thank you for the feedback Gerry and for taking care of our chalet so well. You are welcome back any time! Lovely cosy and warm condo. Immaculate condition. Great village. Dawn was great to communicate with. Loved our stay. Thank you for your feedback Alexandra. You were a wonderful guest to have and we look forward to welcoming you back! This is a very comfortable, high end home. Great views of the valley and surrounding woods, yet very private. An easy 2 min. walk to the slopes at the corner of the road. The kitchen is VERY inviting and has great amenities. The hot tub accommodates 6-8 and is a welcome relaxation at the end of a day of skiing. 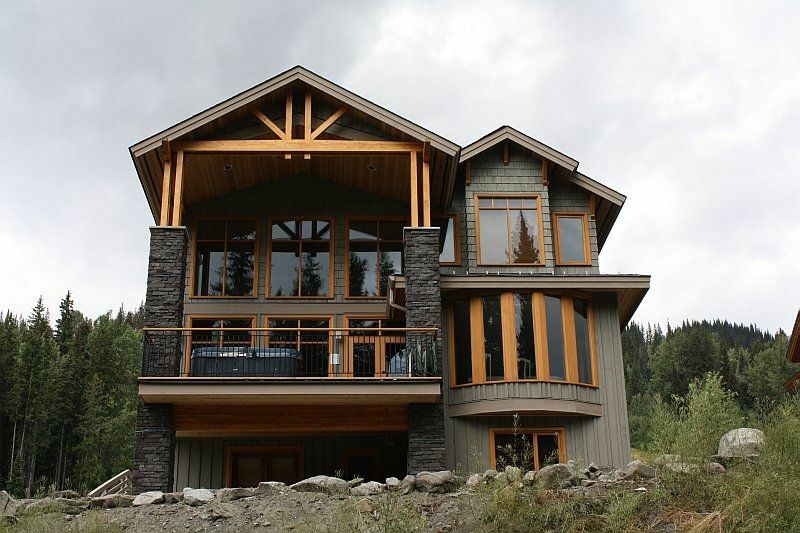 We have stayed at several homes in Sun Peaks and this is one of the nicest we have found. Terrific chalet. Spacious with lots of nice amenities including a great Hot Tub, high end appliances and a terrific coffee maker that acts like your own Barista! Lots of attention to detail. This is one of the nicest places our group has stayed at. We were an extended family with ages from 2 to 77 and love the chalet. The home is extremely well equipped, clean and simply beautifully stunning! A perfect Ski home, definitely ski in and ski out. The owner was very accommodating and supportive and the instructions were very good. We will be back. An absouey gorgeous home. Well kept, well stocked with all accessories we needed. Built in coffeemaker was divine. It is larger than it looks in the pics. Halls are wide, rooms are big. Full bath in each room made things so comfortable. Hot tub was clean, big and well maintained. Such a lovely part of our trip. Thanks so much. Thank you for the wonderful feedback! We really do take great pride in our Chalet and put a lot of work into it, so it truly is a great feeling to receive such positive feedback.